Mostly I work like a hermit: in an attic with two window air conditioners fighting the heat and providing an endless source of dull noise that furthers my sense of productive isolation. For the last few days of record-high temperatures, the AC units have been losing the fight. Today they’ve been winning, so I haven’t been paying any attention to the world outside. A perfect excuse to take a snack out on the back porch for a front row seat on the best of nature’s summer theatre. (One of the things I miss when I’m in Santa Barbara, though I’ve been missing Santa Barbara mightily during the heat wave here.) And sympathizing with the passengers that are surely soon delayed on approach to Logan. [One hour later…] Well, that was a case of wishful blogging. 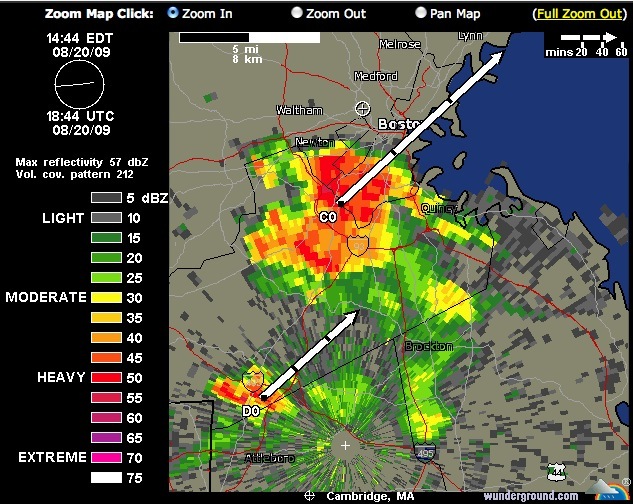 The storm cell passed over Boston but missed most of Cambridge. I see here another small one is on the way (right now it’s over Ashland, between Hollston and Framingham), but it might be pooped out by the time it gets here. [Next morning…] The small patch of rain never got here. In the evening I went to a barbeque in a Cambridge backyard and the place was still soaked by the rain that missed my place. This morning it’s hot all over again. This was a few days ago now, but I “work” right near you (as in work mostly from home) and definitely felt your pain last week. Eek! Glad that it’s a touch cooler today….